First Group Of Refugees From Australian Detention Centers Is Headed To The U.S. : The Two-Way It's part of a deal between the Obama administration and Australia. President Trump called the agreement "horrible" in a heated phone call with Australian Prime Minister Malcolm Turnbull in January. A handout photo from the Australian Department of Immigration and Citizenship shows the detention camp at Manus Island in 2012. Some asylum-seekers are heading to the U.S. for resettlement. It's the same deal that was the subject of a contentious phone call between President Trump and Australian Prime Minister Malcolm Turnbull in January. "I think it is a horrible deal, a disgusting deal that I would have never made," Trump said, according to The Washington Post. "As far as I am concerned, that is enough Malcom [sic]. I have had it." Despite the president's response — and the Trump administration's announcement Wednesday that it plans to lower the total number of refugees that the U.S. will accept next year to 45,000 — the White House appears to be sticking to the agreement with Australia. "I thank the president and the United States for honoring the deal," Turnbull said in a video message last week. "Around 50 refugees from [Papua New Guinea] and Nauru will be accepted in this first group." Between 22 and 25 men left an all-male detention center on Papua New Guinea's Manus Island earlier this week; 27 people, both men and women, left a second camp on the tiny island nation of Nauru on Wednesday. The refugees hail from countries including Bangladesh, Iran, Sri Lanka, Somalia and Myanmar, according to Australian refugee advocacy group Refugee Action Coalition. "They are being sent to live (some with relatives) in many different states including, Arizona, Texas, California, Oregon and New York," the group said in a statement. The New York Times reports that a U.S. State Department official "confirmed that 54 approved refugees would be notified in the coming days and travel to the United States in the coming weeks." Australia has a policy of sending asylum-seekers attempting to reach Australia by boat to one of the two detention centers. The policy began under former Prime Minister Kevin Rudd in 2013. "No person, no asylum seeker who attempts to reach Australia by boat can ever be resettled in Australia, even if they are found to be a genuine refugee," Reuters correspondent Matt Siegel told NPR last year. More than 1,700 people are still being held on Manus and Nauru, according to Refugee Action Coalition spokesperson Ian Rintoul. Detainees on Nauru face "severe abuse, inhumane treatment, and neglect," Human Rights Watch and Amnesty International said in 2016. The rights groups said asylum-seekers "face neglect by health workers," are denied medical care, and "suffer overwhelming despair — self-harm and suicide attempts are frequent." A former aid worker told NPR she reported "abuse and systemic violations of human right[s] to children and families on Nauru." "It's extremely hot. There's no air conditioning. They live often in tents. It's difficult in terms of the confinement, but I think the real concern for people are the conditions, psychologically, that people go through in terms of being indefinitely detained. Some of these people have been in these camps for three, four, five years, and that leads to an enormous level of self-harm, suicide attempts, especially among — and most disturbingly, amongst children and young children." 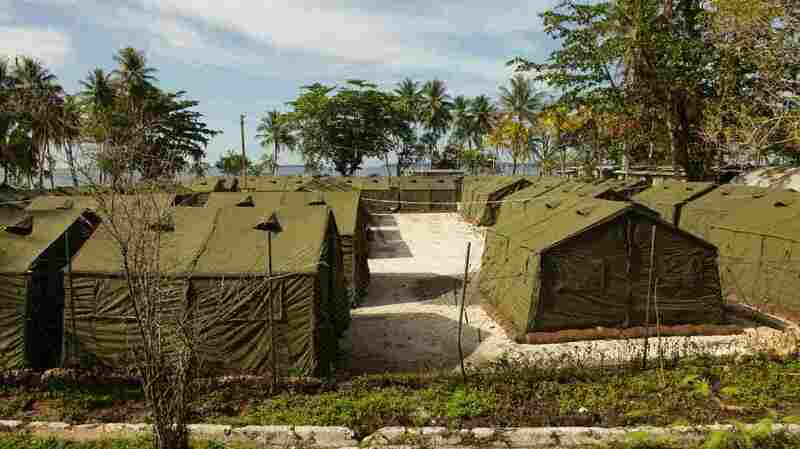 The Guardian has reported that Australia's government says it will close the Manus Island camp by the end of October, after Papua New Guinea's Supreme Court called it illegal. But there are no plans to close the facility at Nauru. The government also says the refugee policy is for humanitarian purposes and that it discourages smugglers and asylum-seekers from trying to reach Australia by boat. Turnbull added that this resettlement of detainees in the U.S. "is a one-off. And it's available only to those found to be refugees who are currently in P.N.G. and Nauru. And is of course subject to the United States' own extreme vetting mandated by the president." "Anyone who comes by boat will be turned back," Turnbull said. "They will not be settled in Australia and they will not be settled in the United States."